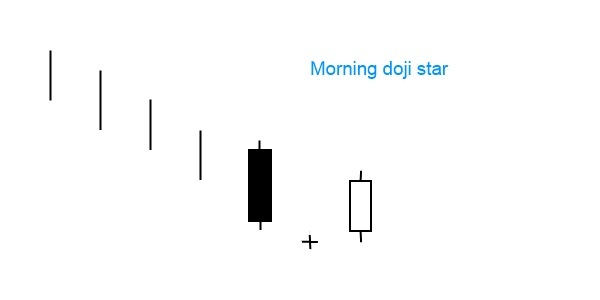 The morning doji star is a bullish reversal pattern that is very similar to the morning star. The difference lies in the middle candle that must be a doji. The pattern forms in a down trend; the first candle is a long black one. The next candle opens lower with a doji that has a small trading range. The last candle – a long white one – closes above the midpoint of the first candle. What happens on the market when a morning doji star appears? The first day with the black candle reinforces the ongoing down trend. The next day shows indecision, as the opening price and closing price are close to each other, thus a doji appears. The impetus of the falling market decreases. On the third day the market opens above the body of the previous doji candlestick, rises up and closes high forming a long white candle. This is an obvious sign of a bullish reversal. Counter part of this pattern in a candle chart is evening doji star pattern.